Most people know that cars are hazardous to the environment, and most people dislike rush hour traffic; yet 77 percent of people drive to work alone in the United States, and two in three people live in suburbs. Urban sprawl, according to authors Bianca Mugyenyi and Yves Engler, is by design. What good is all this motion, [sic] if it takes longer to get where you want to go, if the trip is more expensive, if it’s more dangerous, if you don’t interact with anyone on the way or if there’s no longer anywhere interesting to go? What has been lost in the name of the automobile? However, cars also provide convenience. It used to take me 30 minutes to drive to work from Halifax to Dartmouth, but the bus could take an hour or more. The cost of taking the bus was probably as much or maybe a little more than driving (based solely on fuel costs for the car). By bicycle, I could make it to Dartmouth in 25 minutes, and I did not have to search for parking spaces. Nevertheless, the streets of Halifax and Dartmouth are not prioritized for cyclists. Cycling is not for everyone and especially in inclement weather. But why are the bus rates so high that there is little financial incentive for already insured drivers to take public transport? In Stop Signs: Cars and Capitalism, Mugyenyi and Engler explore such a conundrum. Society has been designed around the car for maximum benefit to the capitalist class. Asphalt covers much of the landscape. Billboards have sprung up alongside highways, turning the outdoors into 24/7 commercials. Mugyenyi and Engler assert, “No great city has an abundance of parking.” Yet, they note that zoning laws require parking lots. The authors point to racist instances where inner city black homes were bulldozed for highways to suburbs, enabling “White flight.” The result: white pollution in black lungs. Suburbs, they write, are bastions of conservatism. They cite studies that indicate a negative correlation between civic engagement and commuting time. The social injustices in which the automobile industry is entangled includes sexism in car advertising, imperialism (Stop Signs links “regime change” in Iran and Iraq to cars), supporting dictatorships (such as in Saudi Arabia), and environmental devastation in association with oil. The authors tell of the pollution of the Niger delta and a people worse off because they lived on top of oil. That environmental devastation is ongoing in Alberta’s Tar Sands, poisoning an indisputably greater resource: water. Mugyenyi and Engler point out that the effects of warming are global. They write of Inuit hunters falling through melting ice. However, Inuit contribute to global warming having “progressed” from dog teams to gas-guzzling snowmobiles. It reminded me of the cars and streets in Male, the capital city of Maldives threatened with submersion. Male only encompasses an area of 5.8 km2 (2.2 sq mi), a flat area which can easily be traversed without cars. There are electric carts on some islands in Maldives, but electricity is too often produced from burning coal, so it is not a solution. Solutions are long in coming, as Stop Signs notes: there has been no major innovation in car technology in last century. The internal combustion engine has efficiency from 20-25 percent. Despite this inefficiency, the automobile need for space has pushed the trolley aside (actively pursued by GM); public transportation has been moved above or below: hence sky trains and subways. Stop Signs relates that in Denver two-thirds of the population use poorly funded public transport. Despite this, substantial subsidies go to foreign automakers. The Bailout in 2009 coughed up $75 billion in taxpayer money from the US and Canadian governments. The Bailout was a unique opportunity for government to grab control (i.e., nationalize) of an industry injurious to the public health, community planning, dignity of labor. The authors claim that subsidies to petroleum industry runs into tens or hundreds of billions. If pricing was priced honestly, the externalities would easily make gas over $10 a gallon. Mugyenyi and Engler mention city entrance fees for cars started in London in 2003 and Stockholm in 2008. I remember that Oslo in 1990 there was a fee for motor vehicles to enter the city. They call for separate lanes for bikes. There has been a struggle to acquire bike space. I had brought my bike with me as a second luggage to get around in Oslo (which, by the way, has a nice tram system), and I also brought my bike with me when I stayed in Copenhagen for three months. Transportation in Denmark was impressive, with three separate, dedicated tiered paths for vehicles, bikes, and pedestrians. They call for subsidizing public transport and not cars. It makes economic sense since building public transport creates more jobs than making highways and reduces the debt load, improves the health of the environment and society. I agree, I would never contend with vehicular traffic when provided with a decent alternative. For instance, I much preferred the – admittedly crowded – metros in Korea and Japan when commuting. This freed my hands and mind for reading or allowing a few more winks after a long night. Using the automotive industry as an exemplar, Mugyenyi and Engler criticized the system of capitalism. It is not just that capitalism is structurally flawed, it is also ideologically dishonest in its pretense to adhere to a system of capitalism. The automobile corporations are massively reliant on government subsidies and intervention in the marketplace to perversely redistribute wealth away from the working classes to the capitalist classes. 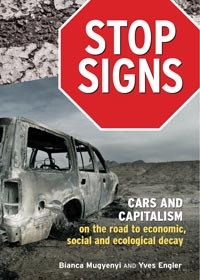 Stop Signs is a riveting read on the perniciousness and the falsities that undergird car culture, and importantly, how we can extricate ourselves from the capitalist-serving morass. This article was posted on Tuesday, May 24th, 2011 at 8:01am and is filed under Book Review, Capitalism, Classism, Poverty, Racism.